Earlier this year, Karen Zeigler and I reported on the long-term decline in the summer employment of U.S.-born teenagers (ages 16-19). In that report we projected a slight improvement in teen summer employment this year, though we were clear that the share working or in the labor force would not return to the level it was in the 1990s. The new data is out and even our slightly optimistic projection turned out to be wrong. 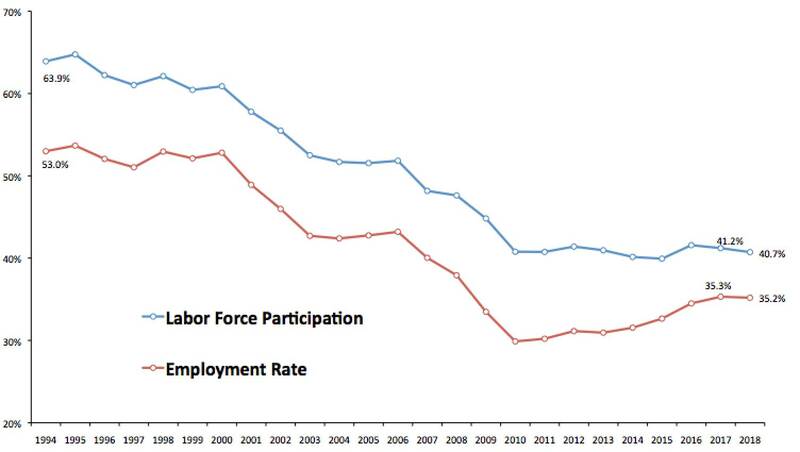 Both the labor force participation rate and the share holding a job declined somewhat between 2017 and 2018 despite a generally improving economy. As we emphasized in our prior report, this is a disconcerting development because there is good research showing that working as a teenager helps instill values that help workers succeed in the workforce. Those who do not work as teenagers, especially those who do not go on to college, tend to work less and earn less later in life than those who did work. As we argued in our prior analysis, it is hard to justify continually bringing in so many foreign workers to do jobs that require little formal education given these numbers. The labor force participation rate (share working or looking for work) of U.S.-born teens actually declined from 41.2 percent in 2017 to 40.7 percent in 2018. The decline in teen labor force participation of U.S.-born teens primarily impacted blacks and Hispanics; white labor force participation rose slightly. The employment rate (share holding a job) declined very slightly from 35.3 percent in 2017 to 35.2 percent in 2018. As is the case with teen labor force participation, the decline in the teen employment rate primarily impacted blacks and Hispanics; the white employment rate rose slightly. The unemployment rate (share looking for a job) does show some improvement, but this is partly because the number of U.S.-born teens out of the labor force, who do not show up in unemployment statistics, increased by 91,000. The deterioration among immigrant teens was even more pronounced than among the native-born in the last year. The labor force participation rate for foreign born teenagers declined from 37.1 percent to 31.4 percent between 2017 and 2018. Their employment rate declined from 31.3 percent to 27.1 percent. An Excel spreadsheet with more detailed information is available here.